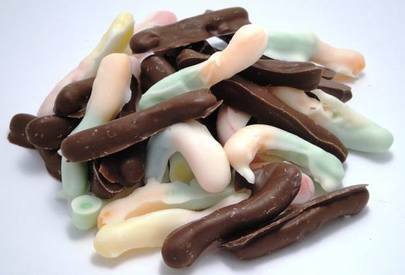 Chocolate covered sour gummy worms! Happy National Gummy Worms Day! Sour gummies are where it's at. Hand me a bag of Gummi Bears, and I'll pass it along (or soak them in vodka). Hand me a bag of Sour Gummy Worms (or Sour Patch Kids, holla! ), and I am all over it. I like the sour tarty-ness that makes your face pucker. Plus, the flavors of sour gummy worms (underneath the sour sugar) are totally better. We all know how I like to make already good things even better, so I dipped them in CHOCOLATE!